Dubai: Social media can’t stop cheering for Pakistan International Airlines’ (PIA) female pilots who flew through a difficult route between Islamabad and Gilgit, Pakistan. 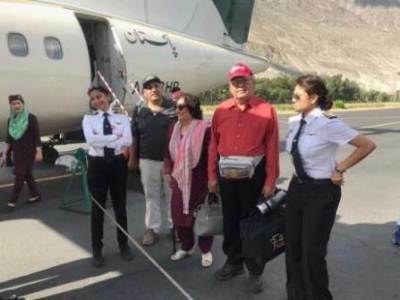 The airline tweeted a picture of smiling Captain Maryam Masood and First Officer Shumaila Mazhar on Wednesday and wrote: “The flight to Gilgit is very challenging and requires a lot of precision and technique. Our dynamic duo, Captain Maryam Masood and First Officer Shumaila Mazhar make it look so easy as they fly through the mountains celebrating the beauty of our northern areas! Way to go! #PIA”. The post has since gone viral, with almost 3,000 retweets and over 9,000 likes. Gilgit lies in a narrow valley and is the main city in Pakistan’s mountainous Gilgit-Baltistan region. The airstrip at Gilgit airport is considered quite dangerous, as it is extremely short and located at the end of a slope. Pakistanis all over social media praised the dynamic duo.